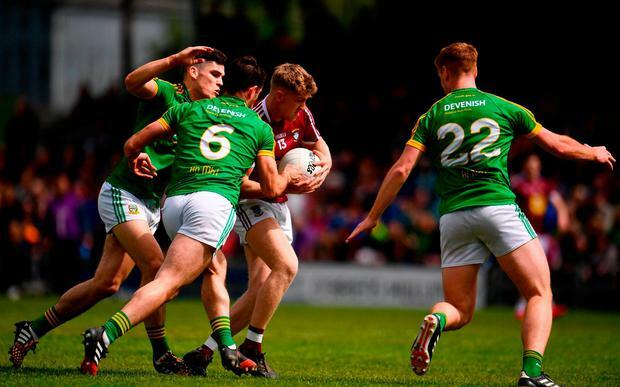 Despite finishing the game with just 13 men, Meath proved far too strong for Westmeath in a disappointing decider, played in front of a big crowd in ideal conditions in Mullingar. This climax of Leinster's pre-season competition had to be refixed a number of times due to the weather earlier this year, but the wait didn't really prove worthwhile. The sides were tied at 0-3 apiece after a low-key opening quarter, during which John Connellan and Donal Lenihan were on song from placed balls at either end. In the 21st minute, a great move by Andy McEntee's charges ended with centre-back Donal Keogan rifling the ball past Stephen Gallagher, who, despite the concession of four goals, pulled off a number of great saves in the face of a Royal onslaught. A well-taken goal by Lenihan - who was in top form - put the visitors 2-3 to 0-4 ahead with 23 minutes elapsed. Two minutes later, midfielder Paddy Kennelly was sent off after picking up his second yellow card. Shortly afterwards, Callum McCormack goaled at the second attempt for Colin Kelly's troops, but Meath still led by 2-7 to 1-7 at half-time. Luke Loughlin gave the home team added hope when he pointed less than 30 seconds after the resumption of play. However, when Lenihan (whose choice as official man of the match was no surprise after a superb haul of 2-8) pounced for his second goal in the 41st minute, Meath never looked in the slightest danger of being overturned thereafter. 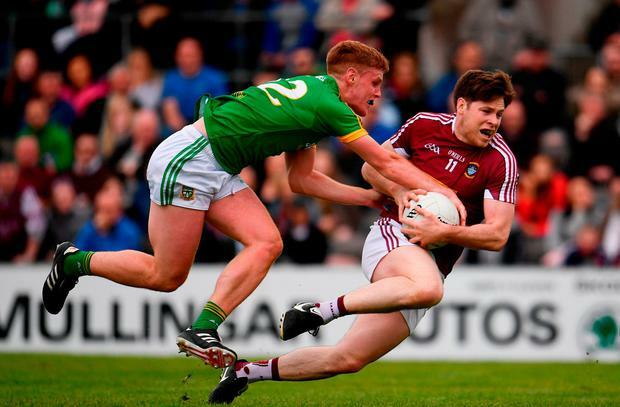 Indeed, a straight red card for substitute Eamon Wallace in the 62nd minute, after the speedy forward had seen just 13 minutes of action, failed to alter the momentum of the game as Westmeath's defence was always in trouble against their direct-running opponents. 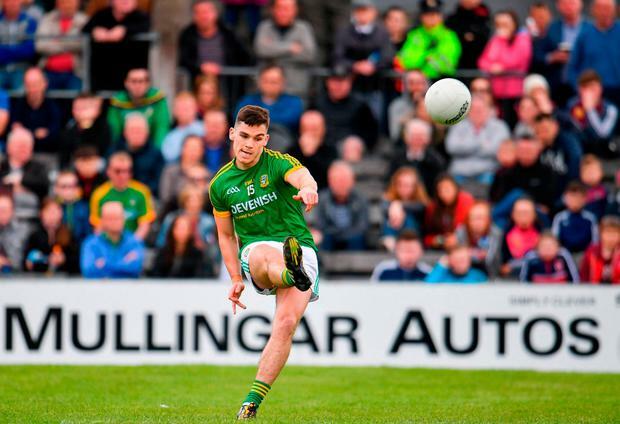 A dominant Meath side rounded off the game in style when a flowing move deep into added-time saw sub Daniel O'Neill slap the ball to the net from close range to wrap up an easy win. 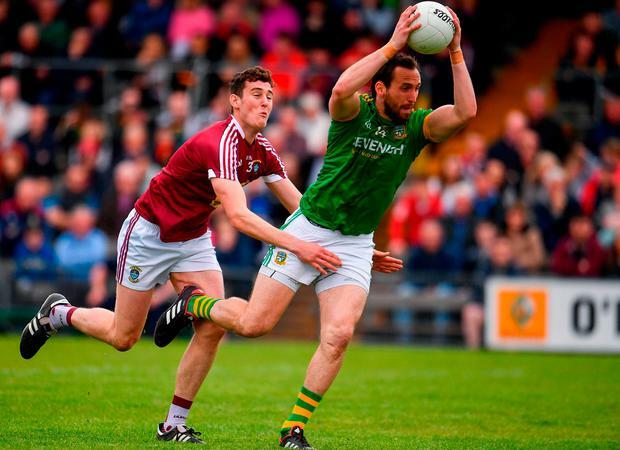 Meath will now be favourites to overcome the challenge of Longford on May 27 in their Leinster quarter-final, while Westmeath will be hoping that talisman John Heslin will be recovered in time for their last-eight joust with Laois a day earlier. 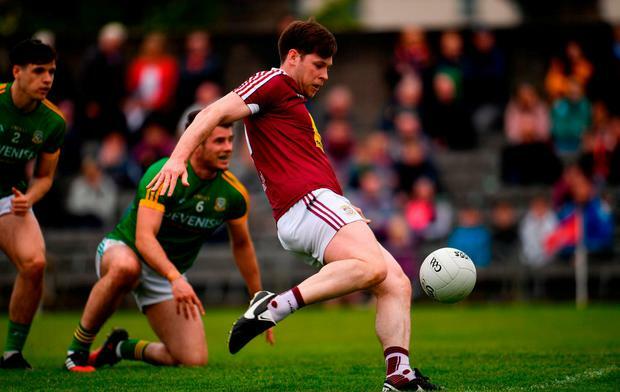 scorers - Meath: D Lenihan 2-8 (0-3fs, 0-1'45'); D Keogan, D O'Neill 1-0 each; C O'Sullivan 0-2; T O'Reilly, P Kennelly, B Brennan 0-1 each.Westmeath: J Connellan 0-6 (5fs); C McCormack 1-0; K Martin 0-3; G Egan, L Loughlin 0-2 each. Meath: A Colgan; S Lavin, C McGill, C Dempsey; J McEntee, D Keogan, S McEntee; B Menton, P Kennelly; B McMahon, B Brennan, M Burke; C O'Sullivan, G Reilly, D Lenihan. Subs: J Wallace for Reilly (47), S Glynn for Dempsey (49), E Wallace for Brennan (49), D O'Neill for Burke (57), T O'Reilly for McMahon (58), C O'Brien for Menton (68), A Flanagan for S McEntee (68), S Curran for Lavin (70 + 2). Westmeath: S Gallagher; R Wallace, S Duncan, B Sayeh; C Slevin, J Gonoud, J Dolan; A Stone, D Daly; K Martin, C McCormack, J Egan; L Loughlin, F Coyne, J Connellan. Subs: N Mulligan for Wallace (25), G Egan for Slevin (h-t), G McCallon for Sayeh (44), R O'Toole for Coyne (45), G Carr for Stone (47), A McGivney for J Egan (56), J Rock for Daly (68), A Loughlin for Mulligan (68), N Scally for McCormack (70 +2), J Moran for Martin (70 + 2).